Cross Fit is a high intensity muscle strength and endurance conditioning program utilizing ballistic, repetitive motions in rapid succession in a short amount of time with minimal or no recovery periods. This type of physical training is gaining more and more popularity over time, drawing interest from the general population. It focuses on the "workout of the day" (WOD), which varies across different participants. CrossFit incorporates exercises from Olympic/power lifting along with gymnastics moves and other sporting activities. However, to date, very few if any studies have examined the pattern of trauma or injury rate among CrossFit athletes. We encountered an unusual case of a female athlete who sustained an acute Achilles tendon rupture while performing box jumps necessitating primary repair. CrossFit is a strength and endurance exercise program that has become popular over the past several years, especially in North America. This popularity is accompanied by various musculoskeletal injuries. To date, there are no studies found examining the incidence of acute Achilles tendon ruptures in regards to CrossFit injuries. This case report will address this gap in the scientific literature. There are also a limited number of studies examining CrossFit associated injuries in general, and the results of these studies are highly variable. The most common anatomical areas affected by CrossFit injuries include the shoulder, lower back, and knee [1,2]. The aim of this study is to review recent citations addressing this type of vigorous activity in regards to injury trends if any, and highlight an unusual case of foot/ankle trauma related to CrossFit training, along with determining how best to minimize potential musculoskeletal injuries and maximize fitness gains, while performing similar types of high intensity workouts. A 24 year-old female medical student avid gym participant referred to the Orthopedic Sports Clinic 2 days after a routine CrossFit workout training session. She sustained an injury to her left hindfoot region during a series of box jumps while completing her early morning “WOD”. She was trying to “beat her time” performing repetitive jumping as fast as she can, felt a pop upon rebound from the ground, resulting in a ruptured Achilles tendon on her 200th jump. She was initially evaluated in the emergency room and given crutches. During the initial physical exam, she had a palpable defect at the gastrosoleus musculotendinous junction and positive Homan’s sign was demonstrated (lack of plantar flexion in the left lower extremity). While both conservative and surgical treatment plans were discussed, our patient opted for the operative procedure. She wanted to “heal up fast” so she can return to working out again. Intra-operative photographs reveal the Achilles tendon to be completely ruptured, confirming pre-operative exam findings. Primary repair was performed successfully four days post-injury (Figure1,2). Patient was placed in a boot with partial weight bearing for protection during the ensuing 6-8 weeks to allow early healing. 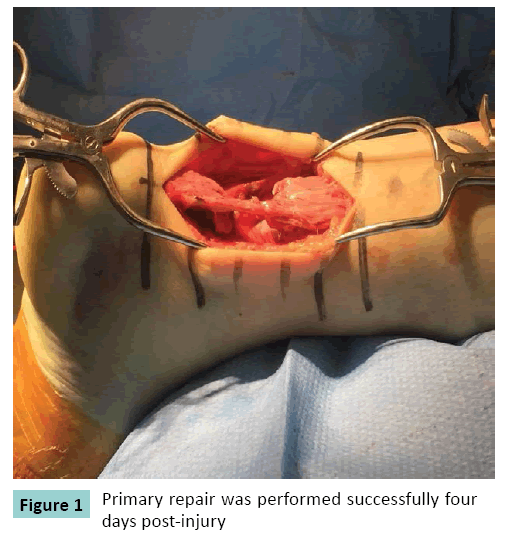 Figure 2: Primary repair was performed successfully four days post-injury. While Achilles tendon ruptures are not common or unique injuries due to CrossFit, the current case highlights the need to look at the wide range of musculoskeletal trauma induced by CrossFit, including but not limited to: lower back pain, shoulder impingement and anterior knee pain. One study determined that the overall injury rate in the study’s cohort of CrossFit participants was 19.4%; these injuries were mentioned to have been mild . Another study determined that 73.5% of CrossFit participants in their cohort sustained musculoskeletal injury, with 9.0% needing surgical intervention . Regarding Achilles tendon injury in particular, a few other exam findings exist to help with a diagnosis of an acute rupture, including the Matles, Copeland, and O’Brien tests. The limitations to these tests include the fact that they must be used in conjunction, and can only diagnose relatively recent Achilles tendon ruptures . As for definitive management of Achilles tendon rupture, one consideration that many papers have explored is early range of motion, while other papers include another factor to consider such as the re-rupture rate . While several surgical techniques exist, including minimally invasive/percutaneous, open primary repair, or delayed reconstruction with grafting, each patient’s treatment should be tailored considering parameters such as time at presentation and age . It was found that minimally invasive methods are utilized in centers considering early range of motion in the treatment of the patient, while open surgical repair is employed in centers where that factor is less of a consideration in the management plan . In a comparison of percutaneous and open procedure surgery, no significant differences were found in the rates of re-rupture, sural neuritis, or wound dehiscence . After surgery, it is crucial for the patient to undergo functional rehabilitation. While a walking boot is employed for the first 5 weeks or so, the remainder of the rehabilitation is largely based on certain criteria, paying heed to factors such as age, associated injuries, pre-injury health status, rehab compliance and especially tissue quality post repair . In a recent meta-analysis comparing patients who participated in a functional rehabilitation program and those who did not, patients that completed functional rehabilitation were able to return to work sooner, and were more satisfied with their overall outcome . Though the incidence of acute Achilles tendon ruptures are more common in men than women, the incidence has drastically been increasing among women in the past couple of years in the United States . Several factors such as age, lack of proper footwear, repetitive overuse and pre-existing physical conditions like body type may all contribute to the rupture rates. Seventy five percent of Achilles tendon ruptures occur in people who are between 30 to 40 years of age engaging in recreational sporting activities . Potential interventions that can be implemented to prevent acute Achilles tendon ruptures during CrossFit and HIIT include: strengthening ankle plantar flexors, wearing athletic shoes customized to the athlete's foot, choosing footwear that have a supportive heel wedge, and increasing training intensity gradually . Regular physical exercise may also be helpful in reducing degeneration of the Achilles tendon by the increase in blood flow, leading to the maintenance of type III collagen . Warming up before exercise will also help to increase the extensibility of the tendon, making it better prepared for physical loading. Avoiding fluoroquinolone antibiotics, corticosteroid injections, and anabolic steroid abuse is prudent, since these medication/ substances have been found to contribute in the degeneration of connective tissues, rendering the Achilles tendon more vulnerable to injury . Alternatively, other modes of enhancing the vascularity of tissue include electroshock wave therapy. This type of treatment may enable a patient to have increased blood flow to the vulnerable tendon areas . However, similar mechanical pulsations used on already compromised tendon integrity as found in calcific tendinopathy, could actually increase the risk of Achilles rupture . Our report demonstrates an unusual case of Achilles tendon rupture occurring in a young, active female while performing Cross Fit training. Hopefully we can bring more awareness to medical plus other allied health professionals dealing with patients involved in high intensity conditioning exercise programs; in order to help reduce and ultimately prevent similar musculoskeletal injuries from happening in the future. The limitations of previous studies include the lack of examination of Cross Fit injuries dealing with the Achilles tendon. While there have been a few studies on Cross Fit injuries, to date, there has not been a systematic review of Cross Fit injuries, how they can be prevented and how best to treat them. This is partially due to the fact that this exercise program is relatively recent but more analysis needs to be done on similar high-intensity workout regimens. The key advantages to this study include the close timing in which the patient was able to see an orthopedic surgeon as well as the athlete's medical knowledge of the situation, which led her to seek more aggressive medical management in a proactive fashion. Another advantage includes the fact that the patient was located relatively close to the hospital where the surgery was performed, which allowed for adequate follow-up. The key limitation of this study is that the participation in the Cross Fit exercise program may only be one of a number of contributing factors to the case. Since neither an extensive medical history nor type of footwear worn by the patient during the time of the injury was known, the rupture of the Achilles tendon cannot be solely ascribed to the participation in the exercise. For example, the patient may have had predisposing factors, such as poor hydration and/or lack of sleep adding to the fatigue level, which could have contributed to this trauma. The clinical significance of the study includes the fact that similar high-intensity programs have been gaining popularity around the country and participants of these programs have encountered a variety of injuries. While musculoskeletal trauma has been the most common types of injury encountered, more research needs to be done on the number and type of injuries that have occurred around the country. Furthermore, more stringent guidelines need to be implemented for participants of these programs so as to prevent similar traumatic episodes in the future. Before we can determine what guidelines will be most beneficial for health reasons, a more systematic analysis needs to be performed regarding prevention methods of each type of injury. Only then will we be able to address the growing health concerns of the multitude of young and old people alike, who engage in these vigorous activities on a regular basis. Weisenthal BM, Beck CA, Maloney MD, DeHaven K.E, & Giordano BD (2014) Injury Rate and Patterns Among CrossFit Athletes. Orthopaedic Journal of Sports Medicine 2(4), 2325967114531177. Hak PT, Hodzovic, E, & Hickey, B (2013) The nature and prevalence of injury during Cross Fit training. Journal of Strength and Conditioning Research / National Strength & Conditioning Association. Hsu AR, Jones CP, Cohen B E, Davis WH, Ellington J K., & Anderson, R. B. (2015) Clinical Outcomes and Complications of Percutaneous Achilles Repair System Versus Open Technique for Acute Achilles Tendon Ruptures. Foot & Ankle International. Soroceanu A, Sidhwa F, Aarabi S, Kaufman A & Glazebrook M (2012) Surgical Versus Nonsurgical Treatment of Acute Achilles Tendon Rupture. 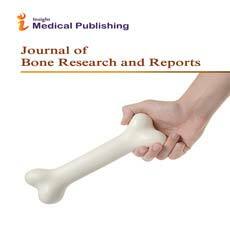 The Journal of Bone and Joint Surgery. American Volume 94: 2136–2143. Bhandari, M., Guyatt, G. H., Siddiqui, F., Morrow, F., Busse, J., Leighton, R. K., … Schemitsch, E. H. (2002). Treatment of acute Achilles tendon ruptures: a systematic overview and metaanalysis. Clinical Orthopaedics and Related Research 400: 190–200. Mark-Christensen T, Troelsen A, Kallemose, T, & Barfod, K. W (2014) Functional rehabilitation of patients with acute Achilles tendon rupture: a meta-analysis of current evidence. Knee Surgery, Sports Traumatology, Arthroscopy: Official Journal of the ESSKA. Yinger K., Mandelbaum, BR, & Almekinders LC (2002) Achilles rupture in the Athlete: Current science and treatment. Clinics in Podiatric Medicine and Surgery 19: 231–250. Wertz J, Galli M, & Borchers, JR (2013) Achilles Tendon Rupture. Sports Health 5: 407–409. Hess GW (2009) Achilles Tendon Rupture? : A Review of Etiology, Population, Anatomy, Risk Factors, and Injury Prevention. Foot & Ankle Specialist. So V, & Pollard H (1997) MANAGEMENT OF ACHILLES TENDON DISORDERS. Australasian Chiropractic & Osteopathy 6: 58–62. Maffulli N, & Ajis A (2008) Management of Chronic Ruptures of the Achilles Tendon. The Journal of Bone & Joint Surgery 90 :1348–1360. Ciccone MM, Notarnicola A, Scicchitano P, Sassara M, Carbonara S, et al. (2012). Shockwave therapy in patients with peripheral artery disease .Advances in Therapy 29: 698–707.